The Department of Intellectual Property (DoIP), Ministry of Economic Affairs has initiated an engagement process with the Korean Invention Promotion Association (KIPA) to take part in the project “2020 IP Sharing Project”. The KIPA is a non-profit organization based in Seoul, South Korea, which was established as an affiliate organization of the Korean Intellectual Property Office (KIPO). The DoIP have found such project initiative to be highly relevant and exciting both in terms of transfer of appropriate technology and facilitation of the use of patent information for innovative improvements to our local products and services. In view of this, the DOIP has initiated an engagement process with KIPA to take part in this relevant and useful Project. In this regard, the DoIP had submitted ten project proposals to KIPA after consultations with the other relevant agencies. The KIPA has shortlisted six of the ten proposals for further scrutiny and selection of the two areas through an onsite visit and further discussion with the stakeholders and thus to make the final selection. For this, a team comprising of three KIPA officials are currently in Bhutan. 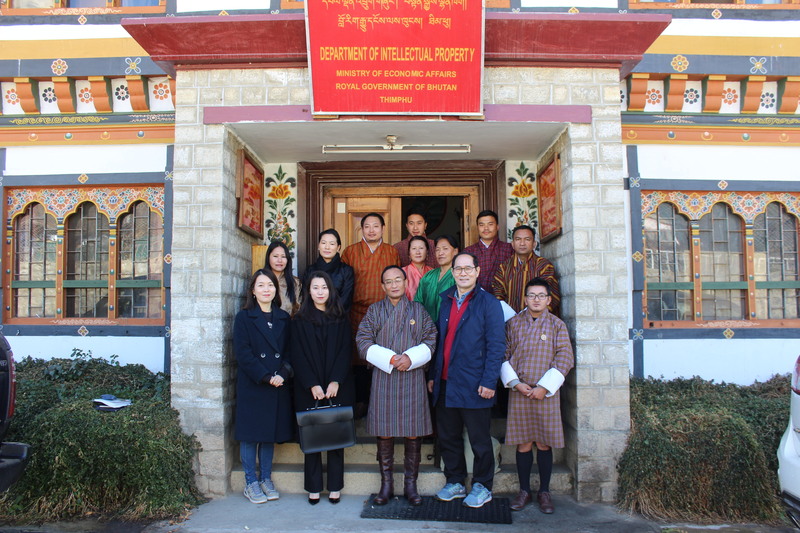 Ms. Hui-Jae Won, Ms. Hyun-Jeong Lee and Mr. Youngtae Kim are in Bhutan from 11-16 February 2019 to finalize the selection of project proposal in consultation with the agencies involved. The team held discussions with the DoIP and also made presentation on KIPA on 11th February, 2019. The KIPA officials are scheduled to meet the Hon’ble Tengye Lyonpo, and Dasho Secretary of the Ministry of Economic Affairs.